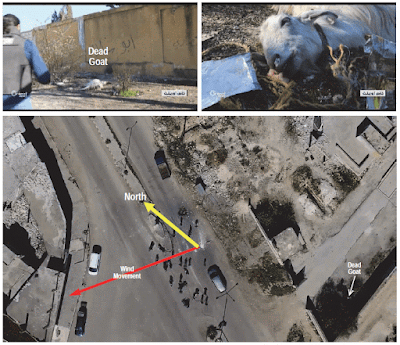 Earlier we reported on Dr. Theodore Postol's work examining the alleged 2017 "sarin bombing" in Khan Sheikhoun, Syria — see "New Evidence that Syrian Gas Story Was Fabricated by the White House" and "Theodore Postol: Khan Sheikhoun Victim Videos Can’t Be from the Claimed "Sarin" Munitions Site" for more information. 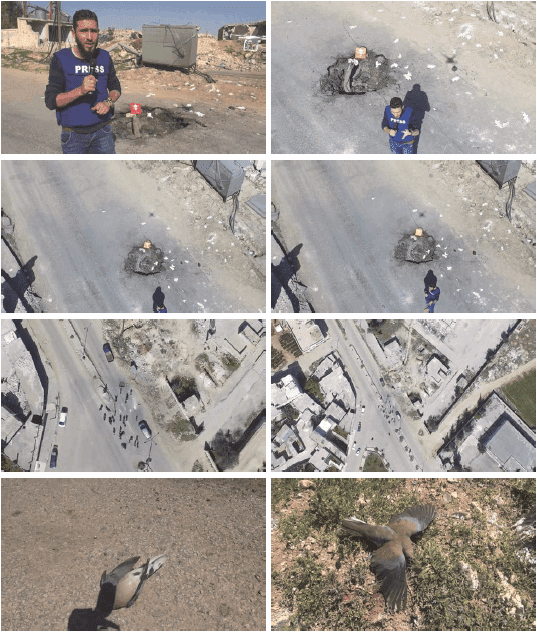 We also wrote about the 2017 Khan Sheikhoun incident here, citing other sources: "Another Intelligence Group Makes the Case: Assad's Responsibility Is Not Proved." It's not just Dr. Postol who's raising questions. 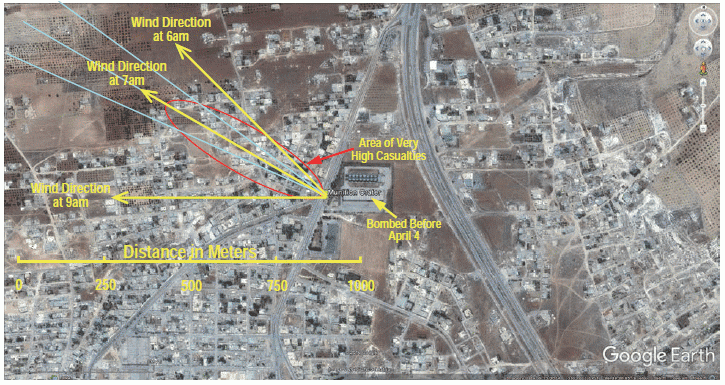 It is now clear from video evidence that the WHR report [White House Intelligence Report of April 11, justifying the U.S. Tomahawk strike after the fact] was fabricated without input from the professional intelligence community. The press reported on April 4 that a nerve agent attack had occurred in Khan Shaykhun, Syria during the early morning hours locally on that day. On April 7, The United States carried out a cruise missile attack on Syria ordered by President Trump. It now appears that the president ordered this cruise missile attack without any valid intelligence to support it. In order to cover up the lack of intelligence to supporting the president’s action, the National Security Council produced a fraudulent intelligence report on April 11 four days later. The individual responsible for this report was Lieutenant General H. R. McMaster, the National Security Advisor. The McMaster report is completely undermined by a significant body of video evidence taken after the alleged sarin attack and before the US cruise missile attack that unambiguously shows the claims in the WHR could not possibly be true. This cannot be explained as a simple error. These charges are serious and two-fold. First, that it's not at all certain there was a "sarin bombing" to begin with. There's plenty of indication that evidence of sarin use, and evidence that it was from an aerial bombing, may well have been manufactured or tampered with by "health officials" in rebel-held (al-Qaeda-connected) Idlib province, where Khan Sheikhoun is located. Second, that given the obvious video evidence of possible tampering — along with videos of health workers and others handling supposed "sarin" victims with bare hands — the White House report (WHR) must both be in error, and be knowingly in error. 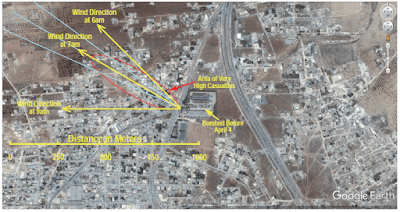 There's a phrase for a government issuing knowingly wrong reports that lead to war, and quite a history behind the practice, including in the U.S.
Keep both of Dr. Postol's conclusions in mind as you read what's below — that the case for an aerial sarin attack in Khan Sheikhoun at the site identified by the White House as "ground zero" is seriously undercut by available video evidence, and that the White House intelligence officials faked conclusions to the contrary in its official Tomahawk-justifying report. On April 18, Dr. Postol issued a Correction to his April 14 report (the second link at the top of this piece; also here), that's even more damning than the original. The Correction document is printed in full below. To my knowledge, so far this is the only Web source for the entire text of this document. The error Dr. Postol made, and corrects below, is a miscalculation in the direction of the wind at the time of the bombing. 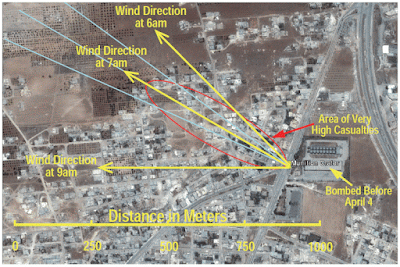 In the original report, Dr. Postol had mistakenly identified the wind as carrying the supposed sarin away from the White House-identified "bomb site" toward the southwest [CORR: southeast] and through a small open (unbuilt) area of the town. The report below contains more information. Note that the location of the "dead goat," supposedly killed by sarin, is upwind of the location that the White House alleges the munition exploded. Who Is Dr. Theodore Postol? Dr. Theodore Postol is Professor Emeritus and former Chair of the Department of Science, Technology and National Security Policy at MIT. You can read a little more about Dr. Postol's background and bona fides at his MIT faculty page. Note especially his work at Argonne National Laboratory; with the Congressional Office of Technology Assessment; and as a scientific adviser to the Chief of Naval Operations. One of his areas of expertise is missile defense systems. Dr. Postol was also called as an expert witness in a pre-Iraq War lawsuit brought against a prominent defense contractor, TRW, for fraud. And now Dr. Postol's document in full. In my earlier report released on April 18, 2017 I quite stupidly misinterpreted the wind-direction convention resulting in my estimates of plume directions being exactly 180° off in direction. This document corrects that error and provides very important new analytic results that follow from that error [emphasis mine (GP)]. These new details are even more problematic because the the WHR cited commercial video as providing information that it used to derive its conclusions that there was a sarin attack from an airdropped munition at this location. 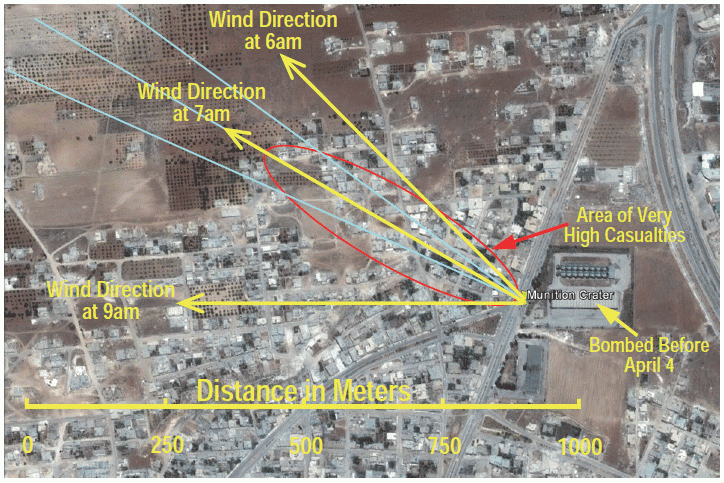 As can be seen by the corrected wind patterns in the labeled photographs on the next page, the predicted direction of the sarin plume would take it immediately into a heavily populated area [emphasis mine (GP)]. 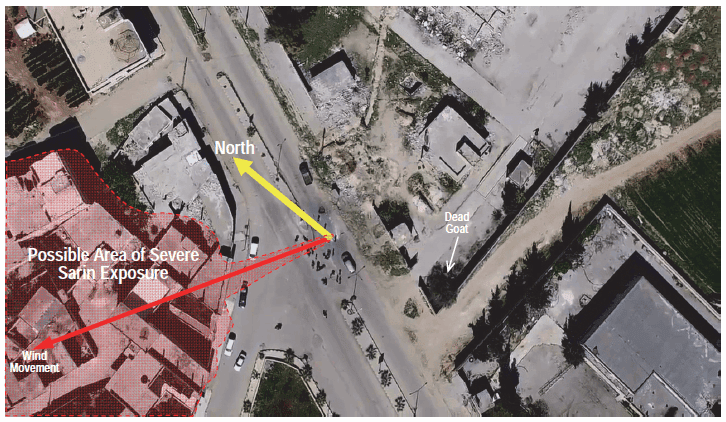 The area immediately adjacent to the north northwest of the road is may not be populated, as there was likely heavy damage to those homes facing the road from a bombing attack that occurred earlier at a warehouse to the direct east of the crater (designated on map below). However, houses that were immediately behind those on the road would have been substantially shielded from shock waves that could have caused heavy damage to those structures. In addition, the crater-area where the alleged sarin release was supposed to have occurred was close enough to the densely populated downwind area that significant amounts of sarin that would have fallen near the crater during the initial aerosol release would have resulted in a persistent plume of toxic sarin being carried into this populated area as the liquid on the ground near the crater evaporated during the day [emphasis mine (GP)]. 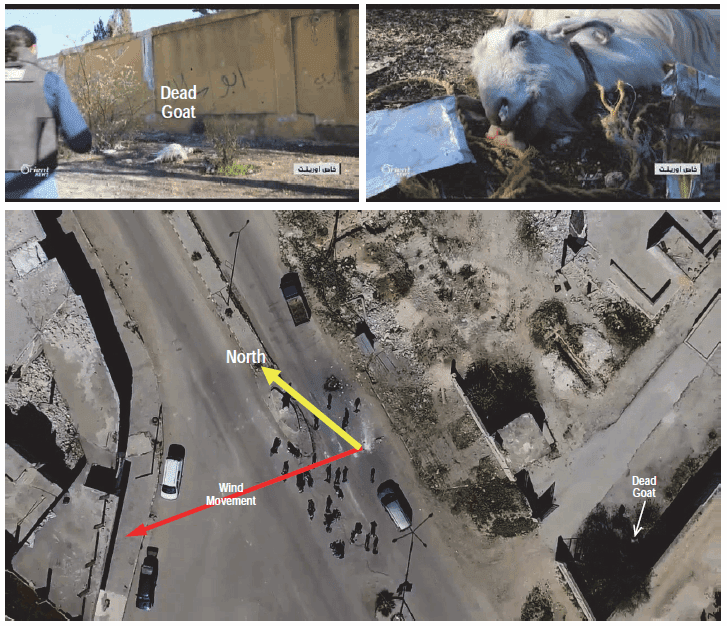 Video taken from a drone at high-altitude operated by the television crew shows the location of the dead goat, which is clearly well up wind of the sarin release point. Under all but implausible conditions, the wind would have carried sarin away from the goat and it would not have been subjected to a significant dose of sarin had largely been within the area where it was found [emphasis mine (GP)]. It is now clear that the publicly available evidence shows exactly where the mass nerve agent poisoning would have occurred if in fact there was an event where significant numbers of people were poisoned by a nerve agent release. This does not rule out the possibility of a nerve agent release somewhere else in the city. However, this completely discredits the WHR’s claims that they knew where the nerve agent release occurred and that they knew the nerve agent release was the result of a airdropped munition [emphasis mine (GP)]. GP, while I appreciate your efforts here, truly, I wish you'd refocus back on climate. 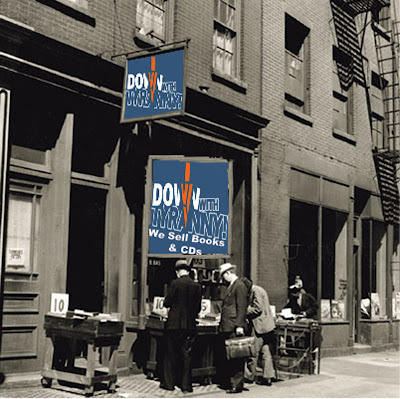 There is much more to cover on it and new developments constantly. And, in the long run, that's far more important than lies from the WH and media. We already know that when drumpf communicates and the media reports, the odds are about 98% that it's lies. Proving the lie seems like overkill at times. Thanks for the comment, Anon. The reason I'm focusing here is that these Postol pieces aren't web-available in full except at DWT and occasionally, at one other place. So I'm creating an archive. In addition, this is a stunning find, don't you think? Also, the take-over of foreign policy by neocons — which would have happened under Clinton as well — is a vital part of this story, and one I want to cover. It may not look like much now, but just wait. War may well be coming. But I do have my eye on climate news, and will not skimp on it, I promise! Medicare For All-- Who's Not On Board?